Who doesn’t love classic Disney? If you’ve got a precious little bundle in your life that needs an introduction to the wonderful world of Mickey & Minnie, this Minnie Mouse ensemble is the perfect project – it’s sure to turn some heads! You’ll also need to know the following stitches: chain (ch), slip stitch (sl st), single crochet (sc), double crochet (dc), half double crochet (hdc), single crochet together (sc2tog), double crochet together (dc2tog), and back loop only (blo). While this might seem a bit intimidating at first, the work is all done at the beginning with gathering the materials. Once you have everything together, you’ll only need to know basic stitches to complete this project. Also, since each piece is so small, they won’t take hardly any time at all to whip up. You might even want to make a couple sets! The end result? A mouse cap, a polka-dot skirt, and little dress shoes. 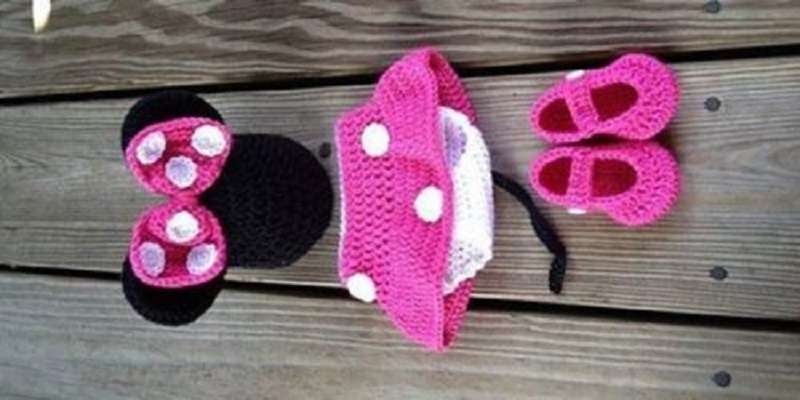 The patterns are also easy to customize, which can be done utilizing varying colors, buttons, and bows (The pattern recommends bows on the shoes and beanie). All the patterns are for size 0-3 months, though of course if you want a larger size, you can commission a set from the provider of these patterns, Knotty Knotty Crochet. You can find the instructions for the patterns as well as the links to the tutorials on Knotty Knotty Crochet.